Where does creativity come from? 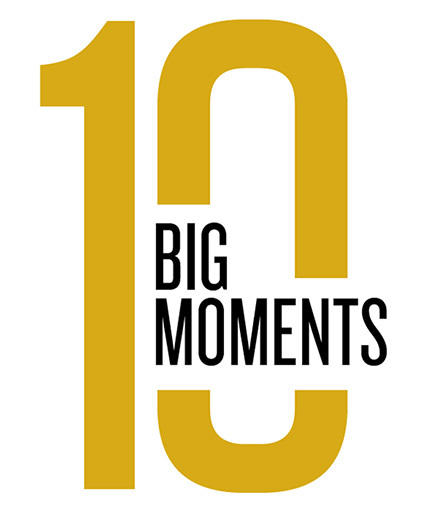 We talk about sparks or moments of inspiration as if they come out of nowhere. But what can appear as a spark often only occurs after a long period of wrestling to find just the right solution. For John C. Hitt, it came after years of thinking deeply about what a modern university could be. 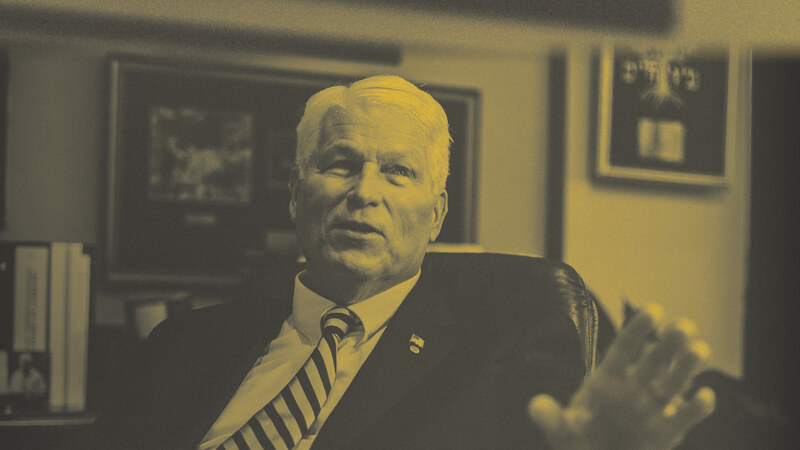 In 1992, not long after he had accepted the position of president at UCF, he was sitting in an airport restaurant when the framework for how to transform UCF crystallized. There, Hitt jotted down the idea on a napkin and handed it to Dan Holsenbeck, currently vice president of university relations. Provide an international focus to our curricula and research programs. Those five goals have guided Hitt’s presidency. They have helped grow UCF from the 115th largest university based on enrollment to one of the largest universities in the nation. In fact, Hitt has conferred more than 80 percent of all degrees awarded since UCF’s founding in 1963, including 93 percent of all doctoral degrees. His ability to see possibilities where others have not has garnered him recognition from Washington Monthly as one of the 10 Most Innovative College Presidents in America, and he is regularly recognized as one of the most powerful people in Orlando, the fastest-growing region in Florida. On March 1, 2017, Hitt celebrated 25 years as president of UCF. 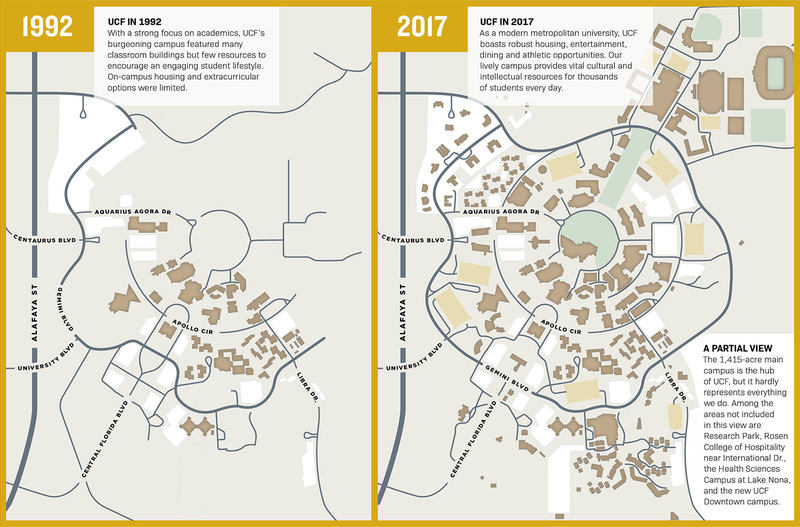 Here are just a few of the ways that an idea — developed over a lifetime, scratched quickly on a napkin — shaped the future of a university and a generation of students. 1996 – UCF founds the 23-county Florida High Tech Corridor Council with the University of South Florida. The University of Florida has since joined, anchoring a public-private effort that has generated more than 3,200 jobs with a direct and indirect economic benefit of $1.3 billion. August 8, 1997 – The Student Union opens. 1998 – The first Pegasus Professor Award is given to Professor Charles Dziuban. Pegasus Professor is the highest designation UCF awards to a senior faculty member, and each one is determined by the president. 2004 – Rosen College of Hospitality opens, thanks to a donation of $10 million and 25 acres of land from Harris Rosen. May 30, 2006 – Governor Jeb Bush signs legislation establishing the College of Medicine. 2006 – UCF launches DirectConnect to UCF, enabling students to pay substantially less for a bachelor’s degree and becoming a model for 2+2 programs (two years at a two-year college plus two years at a four-year university) in the nation. 2007 – UCF opens Spectrum Stadium (formerly Bright House Networks Stadium) and CFE Arena in the same week. January 1, 2014 – UCF defeats No. 6 Baylor 52-42 in the Tostitos Fiesta Bowl in Glendale, Arizona. March 2, 2016 – The Florida Board of Governors approves a new UCF Downtown campus in partnership with Valencia College, the city of Orlando and Creative Village. March 30, 2017 – The Florida Board of Governors approves the UCF Lake Nona Medical Center, which will focus on providing health care services to the community as well as education and research opportunities.